Was out birding yesterday near a beaver pond, close to home. 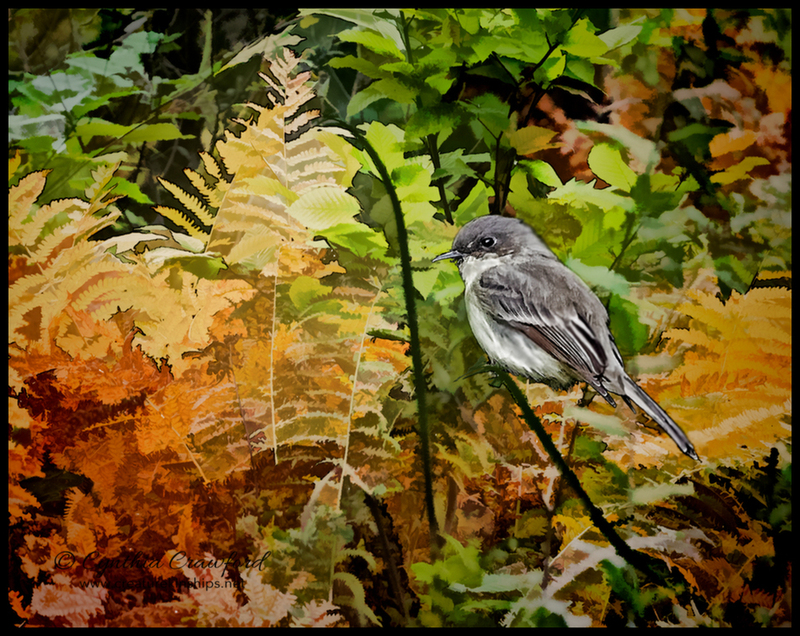 Didn't see much but this phoebe, and a lovely colorful patch of ferns. This is a composite, processed with Topaz Simplify and various tweaks. Had fun, not sure how well it works- always experimenting... . Fall is here! Forty degrees this AM. A beautiful tribute to autumn, Cindy. The Phoebe is perfectly perched with its head turned, and the background ferns are gorgeous. Love the fall color. Your trip to the beaver pond was a huge success – this is a fascinating image. Beautiful autumn colour palette and the little phoebe fits in there a treat! I would say this works very well and the end result is lovely. This would also make a nice tapestry design for a cushion or something similar. Haha! It would be nice if I spellled "falll" right, wouldn't it? And thanks-I'll keep a cushion in mind! Cindy, love the intense foliage and how there is a gradient of both the colors and the thickness (at bottom), along with the thinning (on top). All the while, the Phoebe is posed like a little gem. A thoughtful, nature-loving and pretty presentation!